We love a bit of trading card game action here on Polyhedron Collider and we also love it when people build on board game and card games ideas and integrate them into video games. Because of this we were very excited when Blizzard announced an online collectible card game based on the World of Warcraft universe and rightly so, Blizzard have a track record of producing well-polished and extremely high quality games. Hearthstone is that game and is currently available in beta, it’s taken a while for the beta to make its way to UK shores and now it’s here we’ve had the opportunity to give it a go. Mechanically Hearthstone is a pretty standard collectible card game; you use mana to summon creatures to the battlefield and cast spells. These creatures are then used to attack the opposing character and the first one to inflict 30 points of damage wins the match. 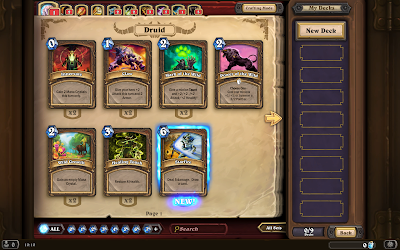 If everything looks rather familiar then you may have played Magic: The Gathering, because Hearthstone really is a simplified version of Magic. The lands may have been replaced by a pool of mana that builds turn on turn, spell colours have been replaced with character cards and blocking doesn’t occur unless a minion has the taunt special ability but there’s no doubting that Hearthstone owes much of its DNA to Richard Garfield's classic card game. 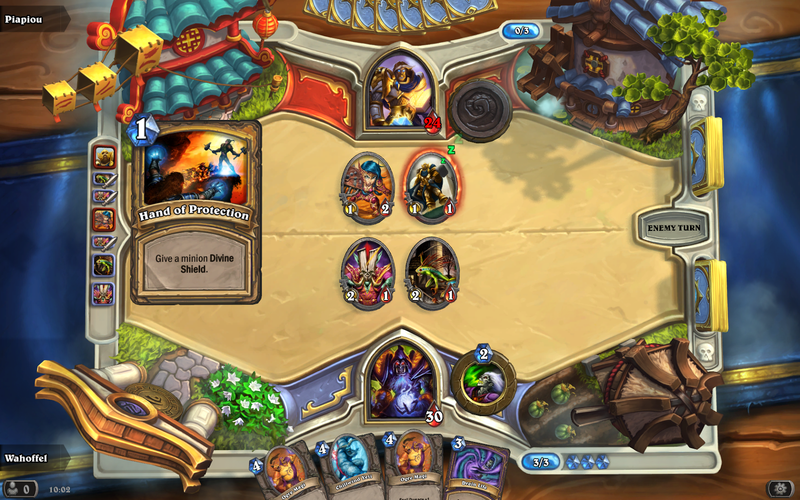 However, what hearthstone does have is pizazz and lots of it. 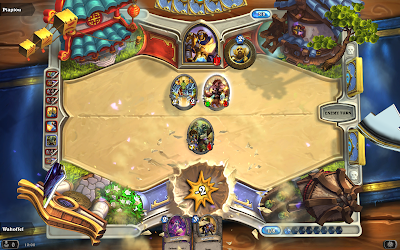 Hearthstone is not only a very pretty game; it’s also smooth and full of little effects and style. Everything about it is slick and professional as you’d expect from a Blizzard game. Although rather cartoony in places, the style does set it apart from other games. As is usual with this kind of card games, you get to customize and build your own decks of cards. These cards can be unlocked through playing the game, levelling up your character as you go. This levelling up will unlock specific cards for your character type but you can also purchase random booster packs. Yes that’s right, a video game includes random decks of cards that can be bought, with either gold earned through challenges or through the spending of real cash. What’s more you can craft cards, the beauty of being in a digital medium is you do things you would never be able to do with real cards. Hearthstone includes your standard multiplayer games, play against randoms or against your friends but where Hearthstone pulls a moonkin out of its hat is that it includes a random booster draft. You have to pay some of that hard earned gold to enter but from there you are given random cards presented to you in threes, pick which card out of the three you wish to keep and the rest are discarded. 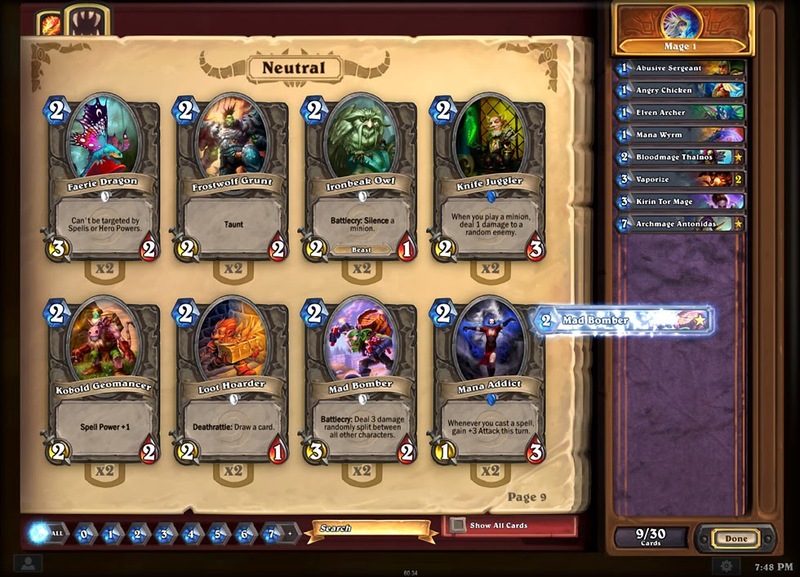 It’s a nice little feature and because Hearthstone doesn’t include its resources as cards you get a reasonably balanced deck from the start. Hearthstone is both surprising and then not really surprising. It’s not surprising that Blizzard have made a high quality game that show’s off its pedigree with every pixel. 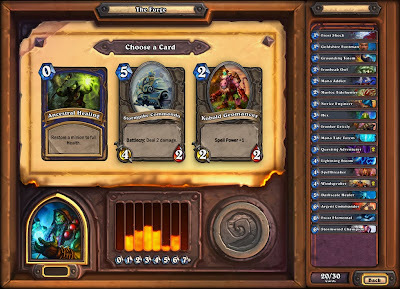 What is surprising is just how good it is to play, when Hearthstone was first announced there was the concern that this was going to be another big software company jumping in on the CCG trend. 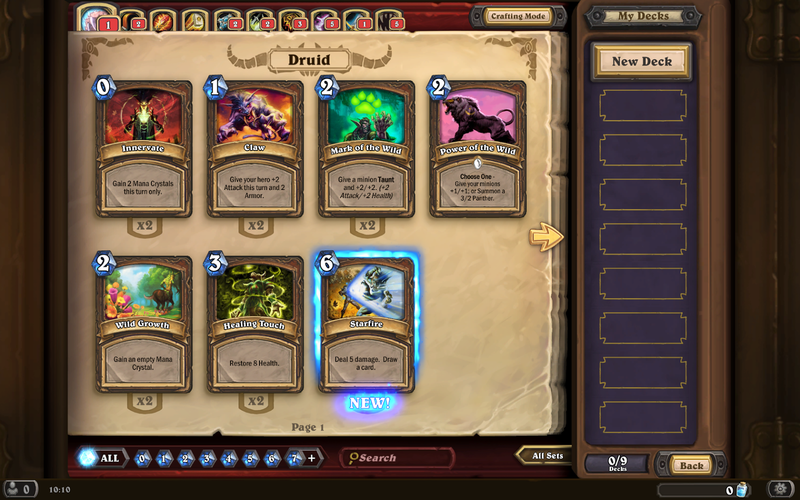 But unlike games like Solforge and War of The Fallen, Blizzard has shown with Hearthstone that they really know what makes a good card game. There’s also no doubting that Hearthstone is a very addictive game, and with each match only taking a few minutes it has that ‘just one more go’ quality. Although I may appeared that I am criticising Hearthstone for being too similar to Magic, it’s definitely scratching the same itch so much so I’m sitting at my computer desk giving sidelong glances to the unused collection of Magic cards sitting on the shelf.